Do you have mountains of papers everywhere? 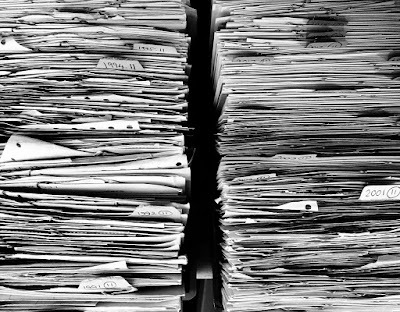 Bills, documents, receipts and more are all piled or stuffed into folders anticipating the day they MIGHT be needed for reference? Yeah...that was me. Paper clutter had always been my nemesis. I was always worried that I might NEED that statement or receipt or bill or whatever it is that proves where I was, what I did or how much I paid. Let me tell you that moving over and over again with multiple file boxes full of nothing but old bills was just ridiculous! I'm not sure when I started to let go of the paper, but I am so glad I did. A lot of the little bits of paper cluttering up your counters and desktop and crumpled in your purse or car contain duplicate information. Your bank statement includes the same information you have on that crumpled ATM receipt. Your credit card statement lists all those tax deductible expenses you had. So what papers do you really need to hang on to? Don't always follow the seven year rule for your personal papers. Certain papers should be kept for up to 3 years and others should be kept forever. Papers confirming the selling/buying of stocks, bonds, etc. Discard your quarterly statements once you receive the year-end statement. Pay stubs. Keep weekly/monthly stubs to match up to your year-end statement and W2. Then shred the stubs. Keep your year-end stubs for at least three years, but preferably up to seven years with your tax returns. Personal utility and telephone bills. You may shred as soon as they are paid, or keep them for financial records. If you plan on selling your property in the near future, keep your records for at least a year. Prospective buyers may want to review recent utility bills to determine what they can expect to be paying for these services. If you really want to let them go, shred them. Most utility companies can send you a digital billing/usage history on request. Credit card statements. If your statements list tax deductible expenses or charitable gifts, keep them with your tax papers. If not, shred at the end of the year. Somecredit card companies will send you an itemized/categorized list of purchases at the end of the year making tax time easier. ATM receipts & bank deposit slips. As soon as these transactions appear on your bank statement, shred them. Medical bills. Hang onto these for at least a year in case you have a dispute over a reimbursement or are billed for something already paid. Previously resolved disputes have been known to crop up again 2 and 3 years later. If the amount in question is very large, you may want to consider hanging on to it a while longer. Shred the papers unless they support a tax deduction, in which case, file with your tax documents. Income tax returns (state and federal) with all documentation. Supporting documents include receipts for business expenses, charitable contributions, and cancelled checks for any other tax-deductible expense. Usually tax returns will be audited within 3 years. Sometimes, an audit may be held 6 years after the return is filed. Therefore it is wise to keep tax returns and all tax documentation for the last seven years. If you haven't kept your past tax returns, they are available from the IRS for a fee of $50 per return (as of January 2019). You can also opt to get just a transcript of your return which will include most of the line items of your return. Wage/salary records and annual payroll check stubs. This would include W-2's, 1099's, etc. Cancelled checks and bank statements. Monthly statements including information from the bank, brokers, mutual funds, 401(k) and other retirement plans, individual retirement accounts (IRAs), Roth IRAs, and 529 college savings plans. Guarantees and warranties. Write the date and place of purchase on the guarantee or warranty. If the serial number is on the box, be sure to cut that out and keep it with your receipt, too. I recently had this issue with a pair of headphones - the headphones didn't have the model number or serial number anywhere on them. Keep records of the type and date of all repairs. I don't usually store these with my regular financial papers. I keep these in manila folders in my filing cabinet. It is a good idea to have one for each of your large appliances, lawn machinery, and power tools. Store these in a safe deposit box at the bank or a fireproof box in your home. If you choose to rent a safe deposit box, it is a good idea to make an inventory of the contents and put the list in your financial notebook or permanent file at home. Consider keeping the files in waterproof bags (inside the fireproof box) to protect them in case of flooding, too. Your will (file a back-up copy with your attorney). Your health care power of attorney, which gives someone the right to make medical decisions for you if you become incapacitated. Copies of your IRA, 401(k) and other retirement account participation plans. These forms determine what happens to the money in these accounts when you die, not your will. If you haven't kept copies of the forms that name your plan beneficiaries, contact your retirement plan custodians and they will send you copies. Keep your beneficiary names and addresses current. All your current insurance policies including home, health, disability, and auto. If something were to happen to your home, you need to have copies of these in a protected place. Keep documents showing the dates and cost of improvements to your home. These records can help in the case of a dispute over damage from flood, fire, or other disasters and can help the insurance company cover your losses. Once you move or sell your home, you no loner need these. You can consider passing the information on to the new home owners. They may appreciate knowing exactly what floor brand is in their living room or where to get replacement tile for the bathroom. For me, taking pictures was the easiest and fastest way to do our home inventory. A great time to do it is while you are packing for a move or unpacking from a move. But don't wait for a move to start documenting what you have. Keep bills/receipts for big purchases (e.g., jewelry, appliances, cars, collectibles, etc.) for proof of their value in the event of loss or damage. Take pictures of these items as well and file with the receipts. Home Inventory - this can be photos or video on a flash drive, written documentation, or both. I recommend if you have a list to be sure to have a printed copy as well as a digital copy so one can be the backup for the other. Deeds, property titles, mortgages, stock and bond certificates, trademark/patent/copyright paperwork, and employment contracts. Automobile/vehicle, truck, and farm machinery titles. When you sell it, give the maintenance records to the new owner along with the title.